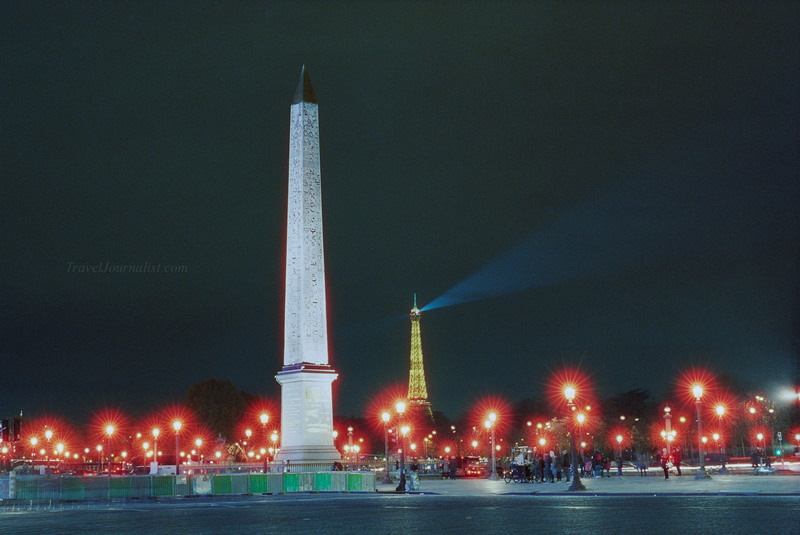 This is a view from le Champs de Mars. I love these halos around the lights. 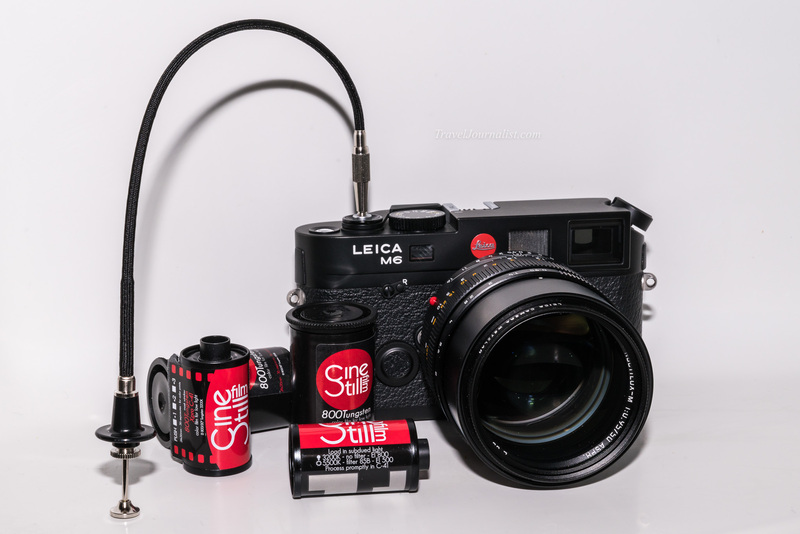 Cinestill Film removed the anti-halation filter from Kodak Vision 3 in order to allow a standard development with C-41. 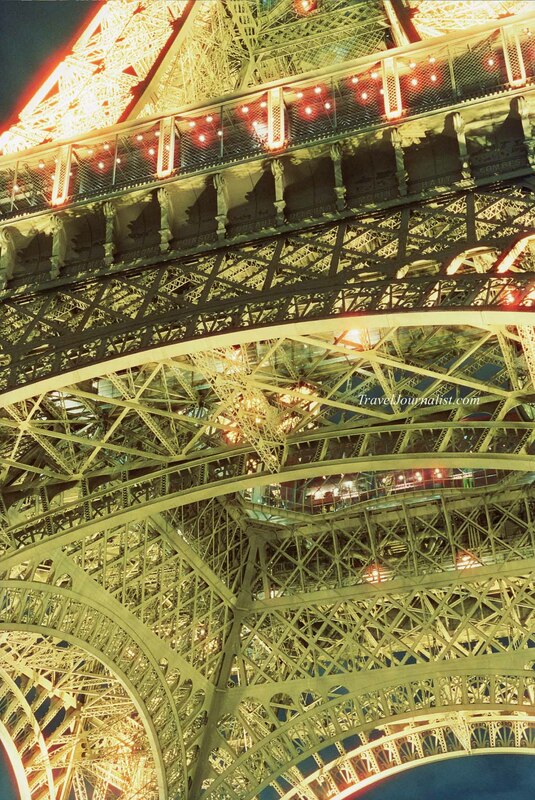 here we can see the details of the structure and of the lightings. 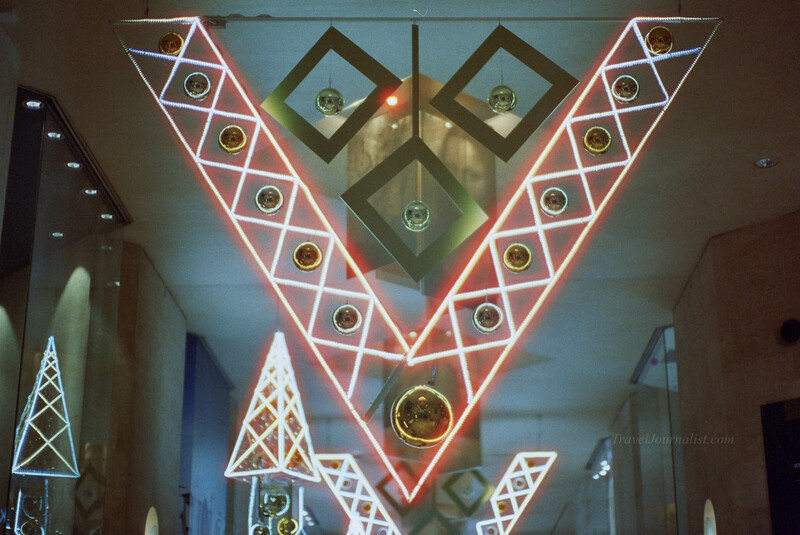 The combinaison of Cinestill 800 and the Noctilux lens make really sharp pictures! 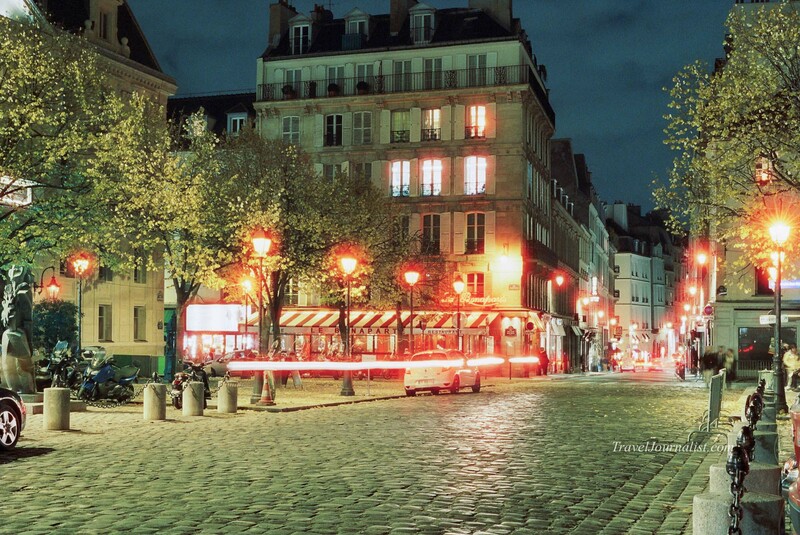 We are now in Saint-Germain neighbourhood where the artists, writers and philosophers meet and debate around their ideas and projects. above is Eglise Saint-Germain. 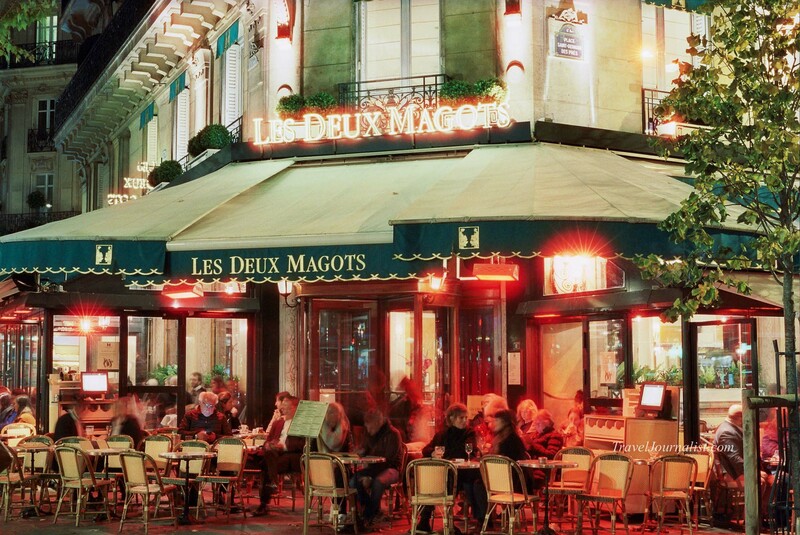 Les Deux Magots is a famous café, as legendary as Le Flore right next to it. 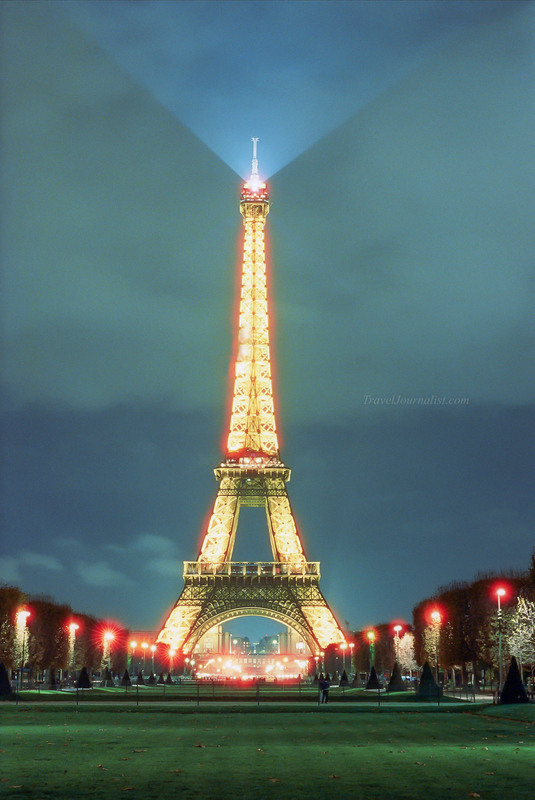 This is another view of the Eiffel Tower, from le Trocadero. 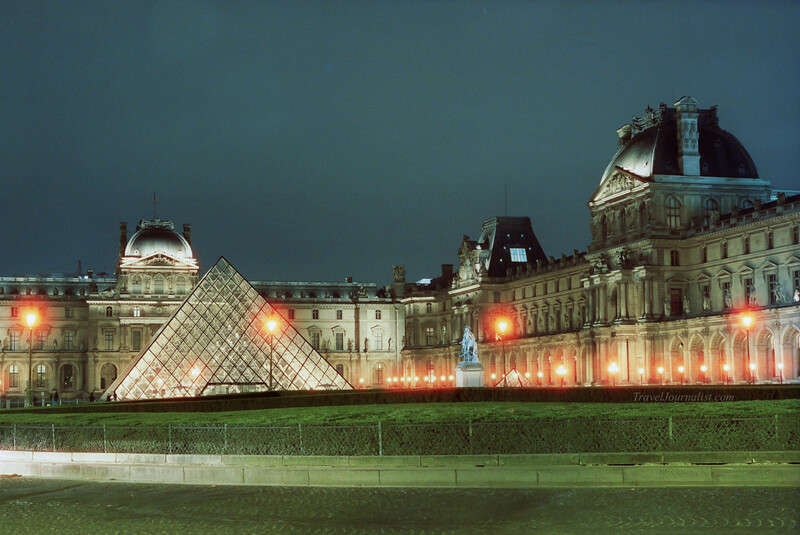 The building visible under the arc is l’Ecole Militaire, and in front is le Champs de Mars where I shot the first picture of this article. 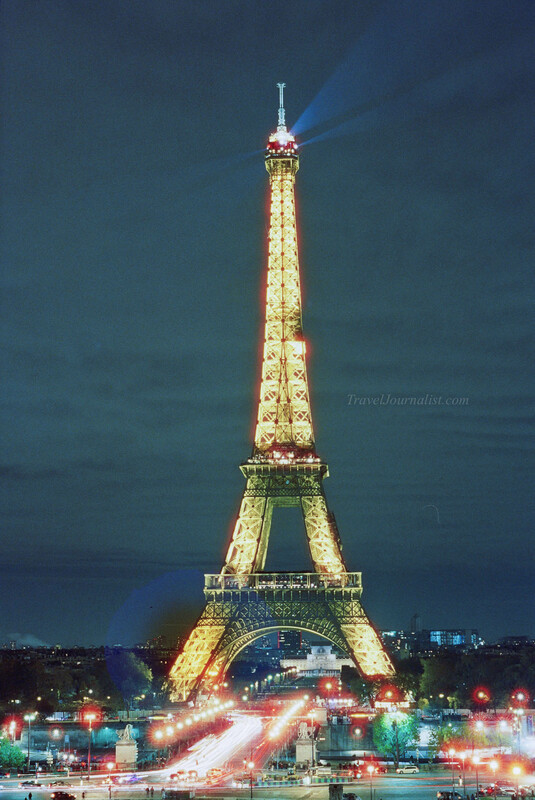 I shot this picture at f/0.95 handheld it was between 6pm and 6.10pm when the lights are sparkling. It’s the only picture of this post shot without a tripod. at this moment the lights were not sparkling, and I did a 5 seconds exposure. 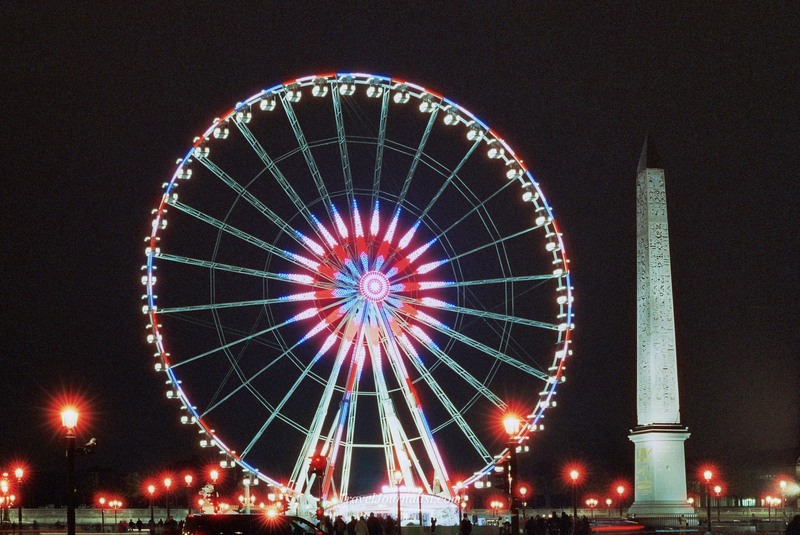 Now we are Place de la Concorde, and this is La Grande Roue de Paris. 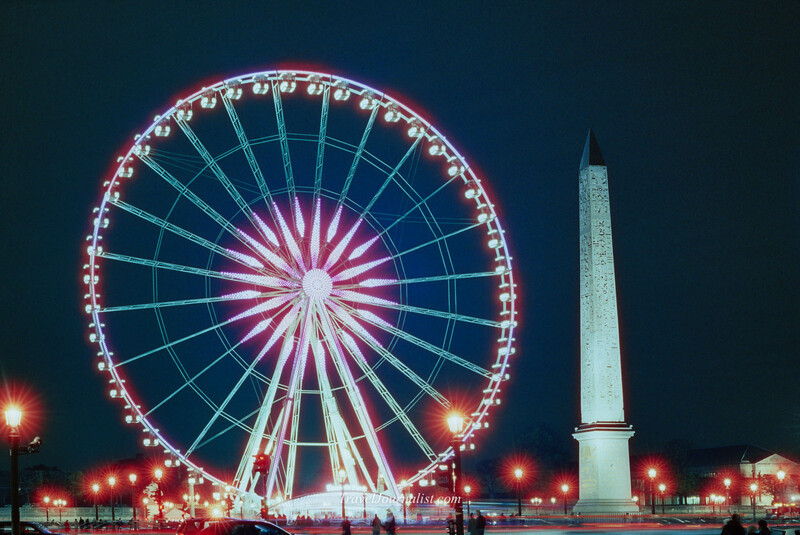 This picture show at the same time La Grande Roue, the Obelisk coming from Egypt, and the Eiffel Tower. 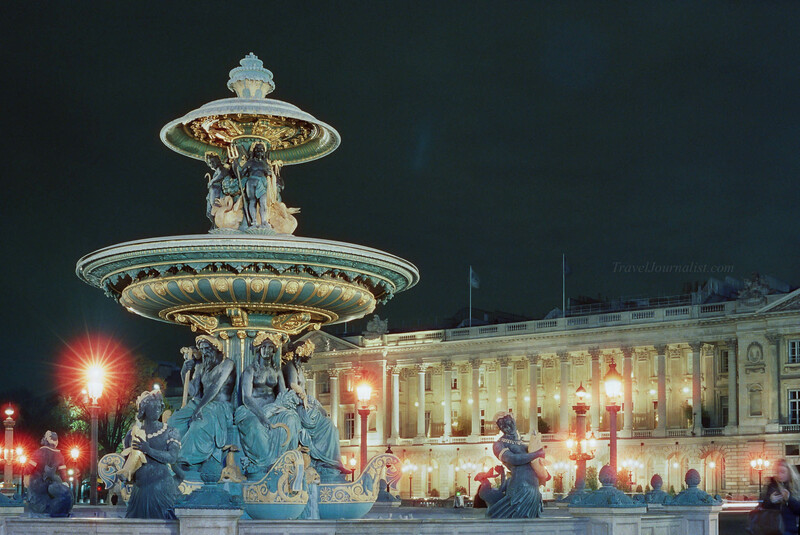 this is the Fountain of River Commerce and Navigation and the legendary Crillon hotel in the background. 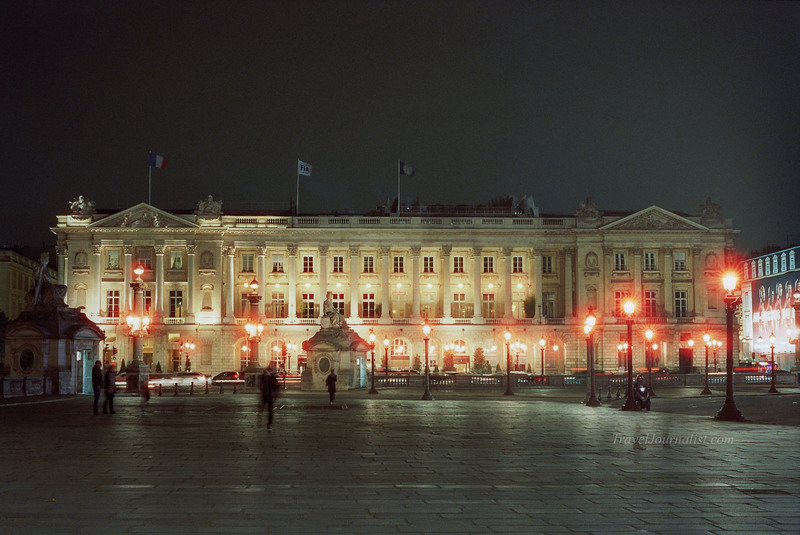 The Crillon hotel is the most luxurious and prestigious hotel in the world. 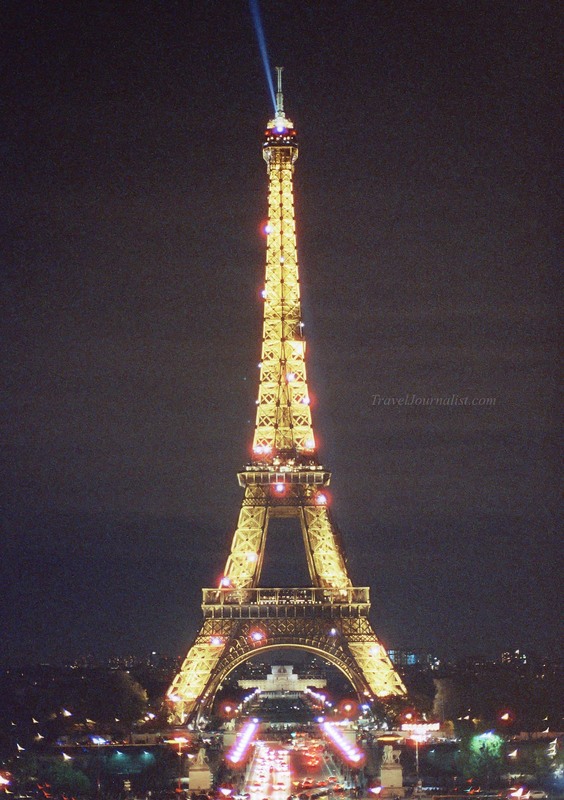 It has recently been renovated and decorated by Karl Lagerfeld. 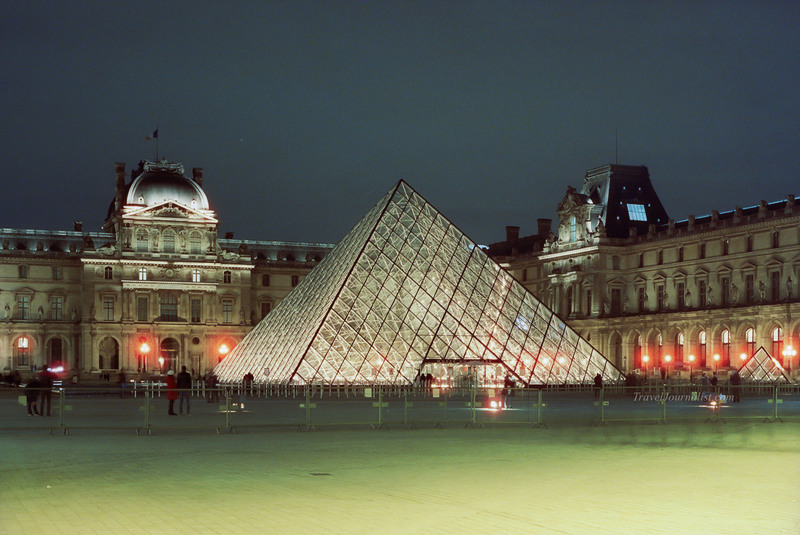 After La Concorde, I went to the Louvre. 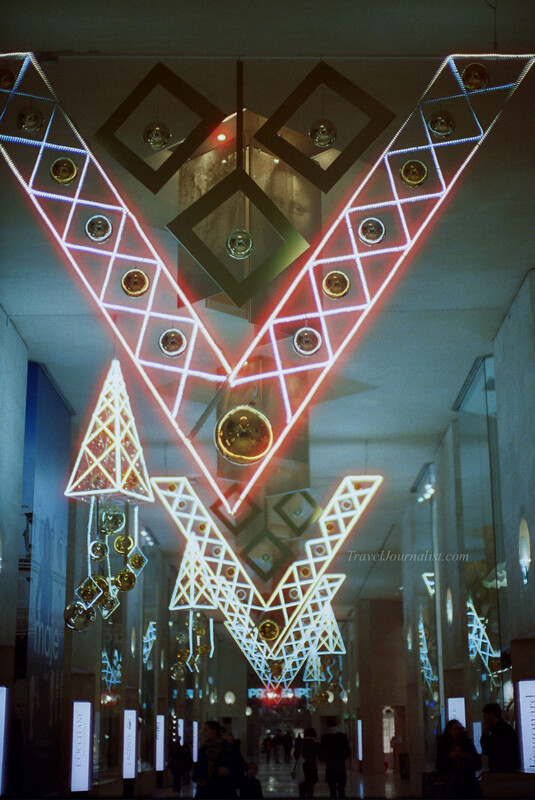 One exit of the metro leads to the shopping mall under the pyramid. They have some interesting and symbolic decorations. 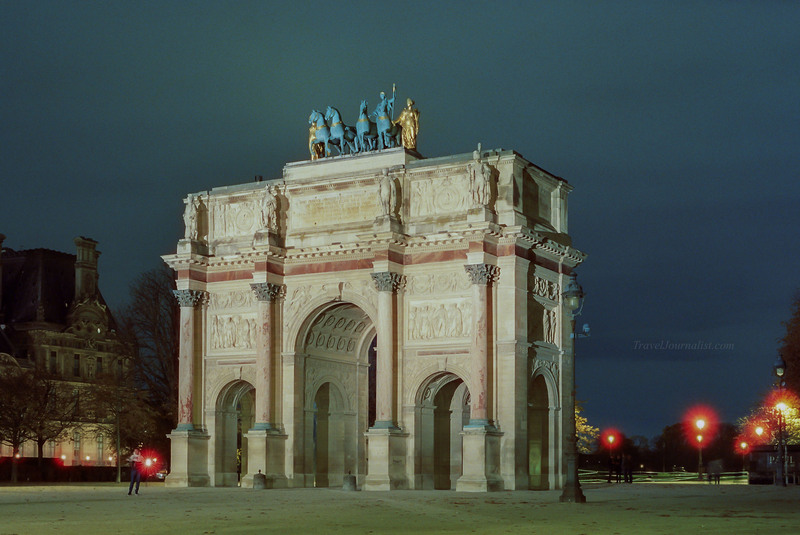 This is the carrousel Arc de Triomphe, in front of the Louvre, at the beginning of the Tuileries garden. 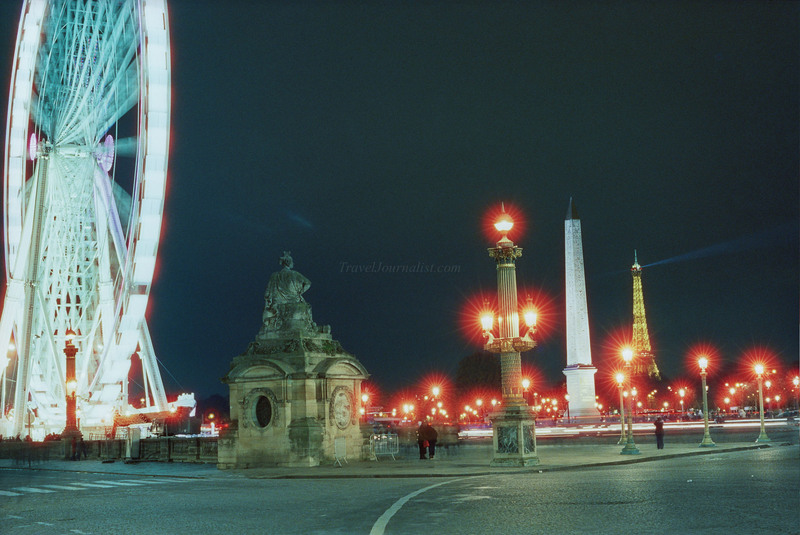 It was a great experience to shoot at night in Paris. The sunset is very early in November, around 5.30 pm, so I could finish the shooting at 8.30 . The weather was nice that day, no rain and a clear sky. 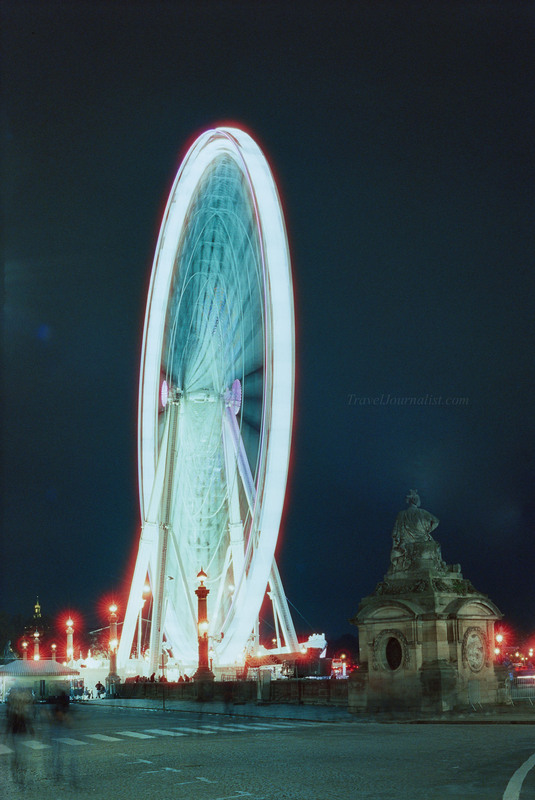 I am really happy with the Leica and the Cinestill 800T. 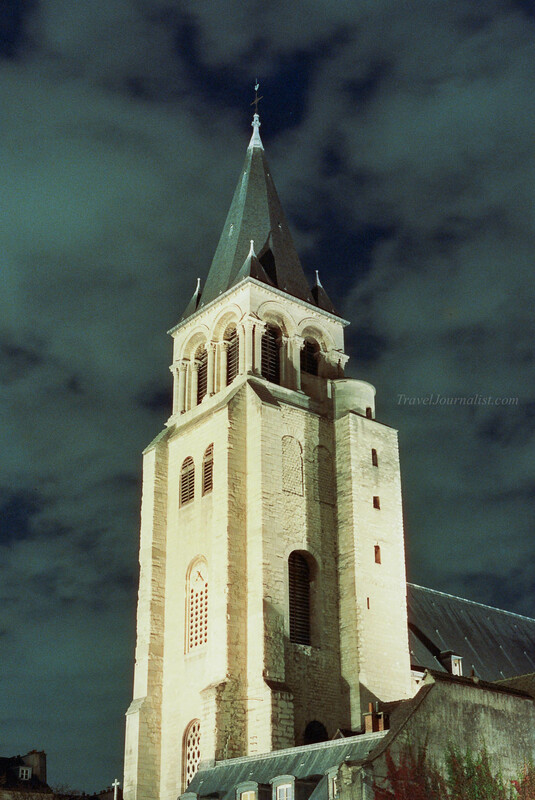 I’m surprised that I can get such sharp and nice pictures from film photography at night. This film is gonna be one of my favorite for sure! 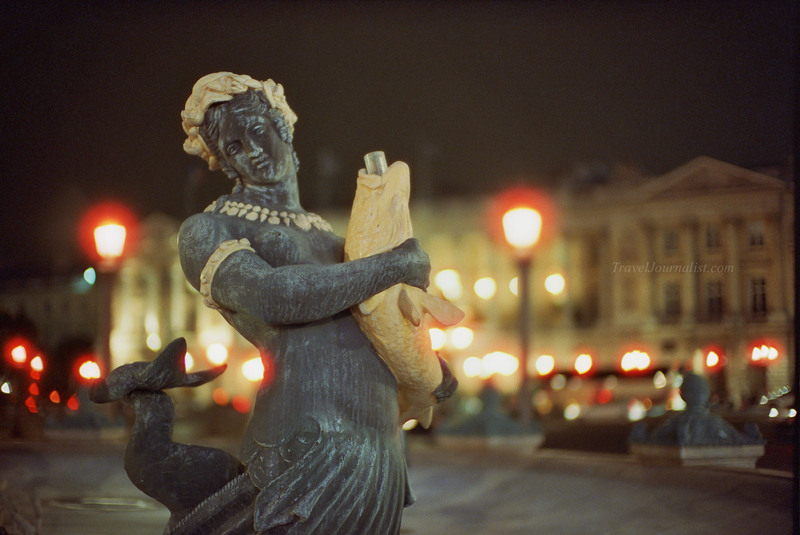 I shot as well some pictures in Paris during the day and I will publish them soon.